Although portions of the new rules apply to passenger-carrying vehicles (specifically, some of the changes that took effect February 27, 2012), the changes that took place on July 1, 2013, apply only to drivers of property-carrying vehicles. What were the compliance dates for the new hours-of-service rule? Effective February 27, 2012, drivers resting in a legally parked vehicle and not using the sleeper berth — whether a bus or a truck — are allowed to log the time as “off duty.” In addition, truck drivers can log off duty for up to 2 hours riding in a passenger seat on a moving vehicle immediately before or after spending at least 8 consecutive hours in a sleeper berth. As of July 1, 2013, the driving of a property-carrying CMV is not permitted if more than 8 consecutive hours have passed since the end of the driver’s last rest break of at least 30 consecutive minutes. 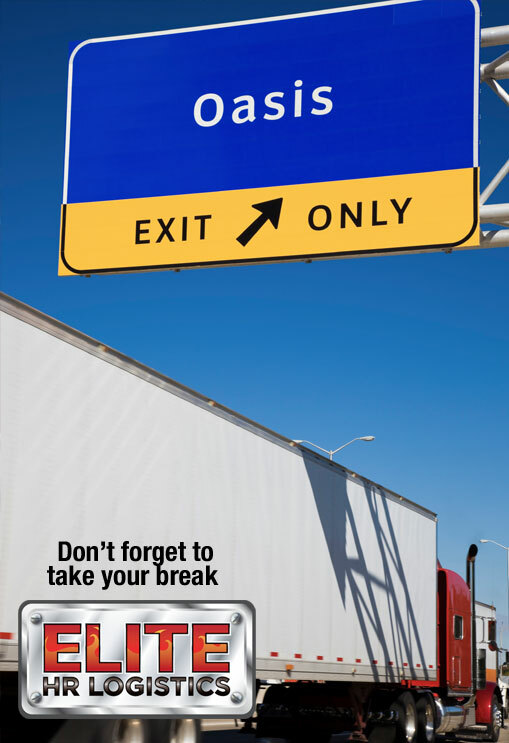 If the driver has not had at least a 30-minute break by the end of his/her eighth hour, the driver must take a 30-minute break before driving. A lunch break or time resting in the sleeper berth will satisfy this in most cases, but the break must be spent “off duty” and/or in a sleeper berth. The biggest change on July 1st was a reduction in the number of hours a driver is allowed to log in a 7-day (168-hour) period, due to changes in the 34-hour “restart” provision. The previous rule allowed a driver to work right up to his or her 60- or 70-hour limit, take a 34-hour restart, and then go again. This allowed drivers to accumulate up to 82 working hours in a 7-day period. As of July 1, 2013, the new rule limits the maximum number of hours a driver can work and drive to 70 hours per week, by limiting when and how often a driver can take a “restart.” One change requires that the restart break include two back-to-back nighttime periods of rest from 1:00 am to 5:00 am, which could force some drivers to be off duty for longer than 34 hours to get a valid restart. Another change limits the use of the restart to once in any 168-hour period (exactly 7 days, down to the hour). The rule specifically says that a driver cannot start another restart break until 168 hours have passed since the start of his or her last restart break. Also, if a driver has multiple potential 34-hour restart periods off within a 7 day period, the driver will need to indicate on the log or time records which one of those breaks is being counted as the restart, if any. Where can I find the new provisions? 49 CFR Sec. 395.3, the basic HOS limits for drivers of property-carrying vehicles. Was there a grace period for compliance? No, not officially. Compliance with all provisions in the new hours-of-service rules was required as of 12:01 a.m. on July 1, 2013. Individual enforcement officers or agencies may have chosen “soft enforcement” for a period of time after July 1, but that was not official or guaranteed. What effect did the court decision have? A long-awaited decision in a legal challenge to the new hours-of-service rules was issued on August 2, 2013. The court upheld most provisions in the new hours-of-service rules but said the FMCSA cannot enforce the new rest-break provision on short-haul drivers. In response to that decision, the FMCSA issued a statement saying that it would no longer enforce the new 30-minute rest-break rule on drivers who qualify for the 100- or 150-air-mile exception in Sec. 395.1(e). The agency is working on revising its regulations to incorporate the new court-ordered exception. How do the new ‘off-duty’ provisions work (as of 2/27/12)? To record such time as “off duty,” the driver must be free of responsibility and obligations to the employer, vehicle, and cargo during the break and must be free to walk away from the vehicle if he/she so chooses. If the company requires the driver to stay in the vehicle or perform work during the break, it must be recorded as “on duty” even if the driver is sitting in a parked vehicle. If you spend up to 2 hours riding in a passenger seat on a moving property-carrying CMV immediately before or after an 8-hour sleeper-berth period, then that time can be recorded as “off duty” AND be excluded from the 14-hour calculation. This should benefit team drivers who no longer have to spend a full 10 hours in the sleeper berth; they can spend 8 hours in the bunk and another 2 hours riding in a passenger seat. Time spent in a moving passenger seat beyond 2 hours must be recorded as “on duty” unless the vehicle is parked and the driver is off duty. Does a driver need a 30-minute break every 8 hours of driving? The 8 hours are consecutive hours, so they include driving and all other time (including any breaks that are less than 30 minutes). The new rule says you have to stop driving CMVs once you reach 8 consecutive hours past the end of your last break of at least 30 consecutive minutes. To be counted as a valid break (for compliance with the 8-hour/30-minute rule), it must be logged “off duty” or “sleeper berth.” Any time that must be logged as “on duty” based on the definition of “on duty time” in section 395.2 cannot count as a valid break (except in the case of certain drivers transporting explosives who must “attend” the cargo and can use attendance time as their break). In general, to be “off duty” the driver must be free of all obligations and responsibilities and free to leave the premises. Note that any kind of “off duty” or “sleeper berth” time will satisfy the rule. For example, a lunch break, a 10-hour break, time spent resting in a sleeper berth (even if used for the “split sleeper” option), or time spent resting in a parked vehicle will satisfy the break requirement in most cases. The key is that drivers must be relieved of all duty and responsibility and be free to walk away from the vehicle and cargo for the duration of the break. Might some drivers need more than one break each day? Yes. Drivers who work long days or who take the 30-minute break too early may need two or more breaks in one day. For example, a driver who takes the break after the first hour of the day and who has another 9 hours of driving ahead will need a second break within 8 hours after the end of the first break. The longer the work day, the more likely a second break could be needed (especially if the first break is taken too early). The 30-minute break must be spent “off duty” and/or in a sleeper berth, but no matter how it is spent it must be counted as part of the driver’s 14-hour allowance. The driver does not get 14 hours of on-duty time in addition to the 30-minute break. It takes 30 minutes out of the driver’s 14 available hours. The breaks will not extend the 14-hour window. No. As of August 2, 2013, drivers who qualify for the “100 air-mile radius” or “non-CDL 150 air-mile radius” provisions in section 395.1(e) are NOT required to take the minimum 30-minute break. Note that certain drives hauling radioactive materials and who are operating under contract with the Department of Energy have been given an exemption that allows them to use the exception granted to drivers transporting explosives (see Sec. 395.1(q)). Under the new rules, is the 34-hour restart provision still optional? Yes, the restart provision is still optional. For example, a driver who works 8 hours per day, 7 days per week, would never need to use the restart provision because he/she would never reach the 60- or 70-hour limit. Drivers may continue to keep a running total or “recap” of their hours over the past 7 or 8 days and “do the math” each day to determine when they may need time off before driving again. In some cases, getting a restart will be the quickest way to get back on the road. How does the 1 a.m. – 5 a.m. provision work? This restriction forces drivers to get two, back-to-back, nighttime periods of rest as part of their 34-hour restart break, even if they normally work at night. Under this new rule, for a rest break to count as a “restart,” it must include the 28 consecutive hours from 1 a.m. on the first day until 5 a.m. on the following day, plus enough additional time on either end (at least 6 hours) to total at least 34 hours. For example, a driver can get a restart by going off duty from 7:00 p.m. on Friday until 5:00 a.m. on Sunday. The break includes the hours from 1-5 a.m. on Saturday morning and again on Sunday morning and is at least 34 hours long. Drivers will only be able to take exactly 34 hours off to get their restart if they begin their break between 7 p.m. and 1 a.m. If they start earlier than 7 p.m. or after 1 a.m., they’ll need more than 34 hours off. Do the 1 a.m. – 5 a.m. constraints apply to any of the 24-hour restart provisions? No, the changes to the 34-hour restart have no effect on any of the 24-hour restart provisions (which only apply to a limited set of eligible drivers). The 24-hour restart provisions were set in law by Congress, so the FMCSA is not authorized to change them. How does the 168-hour-rule work? The purpose of the 168-hour rule (according to the DOT) is to make sure that drivers cannot put in 70 hours of work, immediately take a restart, and then immediately go back to driving, week after week. This results in drivers being able to average about 82 hours per week instead of a maximum of 70. Under this restriction, drivers are not able to start another “restart” break until 168 consecutive hours — exactly 7 days — have passed since the start of their last “restart” break. For example, a driver who begins a restart break at 8:00 p.m. on a Tuesday will not be able to start another restart break until 8:00 p.m. or later on the following Tuesday, even if the driver runs out of hours long before then. What if a driver takes several “restart” breaks in a week? If a driver takes more than one period of 34 hours off duty within a 168-hour period, only one of those breaks (if any) will count as a restart, and the driver must indicate which rest period is being used as the restart by entering a remark on the log. Are drivers from Canada or Mexico affected by the new HOS rules?